boliao baton but i like~ - A mummy's inane blabberings.. So lancerlord, this entry is coz of u.. Heh..I'm sure some of you probably remembered one of my very early post when I posted a pic of my shoe collection when I did spring cleaning. I was able to fit almost all of my shoes into one frame. Somehow,this time round,I simply couldn't. And I still didn't get every pair in coz I got quite tired of taking them out of my shoe cabinet/boxes..Alamak, methinks my smelly collection grew..
Mostly heels coz i'm so katik! 8 (including slippers/sandals). He got such tiny feet!! Yeah..am on leave tomorrow. Gonna have drumming lessons! Should be fun! haiyah why u pass to me!! my shoe collection some at home some here! shld ask dexter to take picture of HIS collection! aiden's shoes are so cute! yeah..they are so tiny. I love his baby shoes more. Still keep them for memory sake! Drumming lessons? How cool are you? goodness gracious! that's a lot of shoes! and you only have two feet. waitaminit... you only have two feet right? and next time you're taking pictures without flash, trying changing your white balance to tungsten (when it's warm lighting) so that the pictures don't have such a strong colour cast. Thanks! I don't seem to be able to find tungsen..there's daylight,incandescent,florescent,cloudy, shade and speedlight. How? Am using a Coolpix 4200. I'm having problems with my nikon and i cant find the instruction manual. I didn't even have half of your collection and hubby starts nagging. heh..hub nags at times too mainly becuz my shoes take up most of the space in our shoe cabinet..anyway, most are cheap shoes :P I don't usually buy expensive ones coz i wear them out quite fast. I must print this entry out and show Glen. That will stop him from saying anymore nonsense. 70+ pairs! At my peak, only about 30 pairs. Now, probably 15? the most. 70+! I fainted on seeing those. How do you choose what to wear??? No. 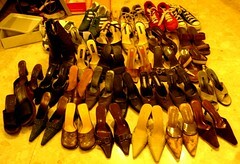 of shoes I have - can count with your 2 hands - less than 10. Even DH and my boys have more shoes than me. I have been steadily reducing my shoes over the years, trying to wear them out, and not buying unless necc simply cos I have no space in the shoe cabinet. But at its peak, I don't think I even have as many pairs as you! okay..honestly, what happened was after my pregnancy, my feet actually grew by 1 size..so all my size 5 shoes i couldnt wear anymore..so i bought more shoes in 6, threw/sold some of my shoes and kept the nicer ones.Now my feet shrunk my half size after i lost weight, so i could wear both size 5 & 6 now :D..
but we both got tired after a while hehe.. Anyway, took that opportunity to throw away some of the more rotten/unused shoes too and gave some to my helper. you wear such high heels, do you fall over often? i find that happening to me alot, maybe coz i don't pay attention to what my feet's doing, so i'm sticking to stumpier heels. strangely, i trip more when i wear flats :P..I can run quite fast in heels..habit lah :D..
i JUST saw this leh!!! why i so slow!!! anyways i'm at school now haha i shall do this when I'm home. I don't have many shoes!